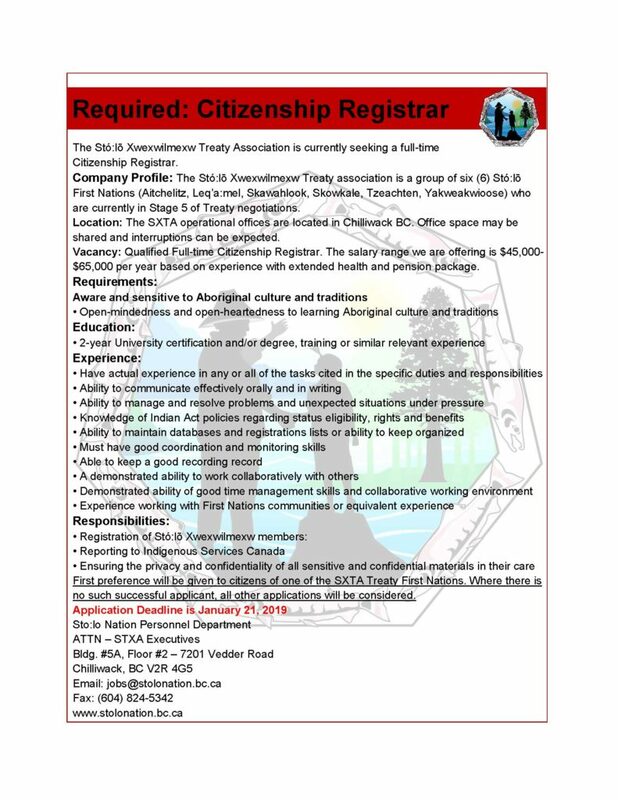 The Sto:lo Xwexwilmexw Treaty Association is seeking a Community Liaison Assistant. 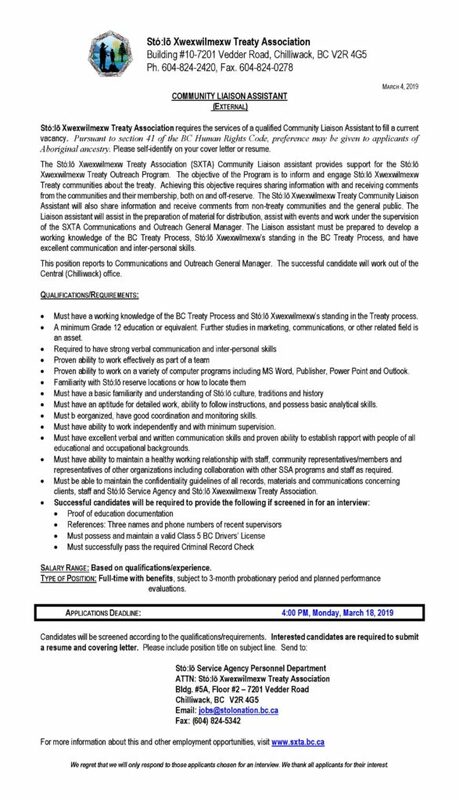 The Sto:lo Xwexwilmexw Treaty Association is seeking a Multi-Media Communication Coordinator. Join us for a weekend of fun and learning about leadership and governance. 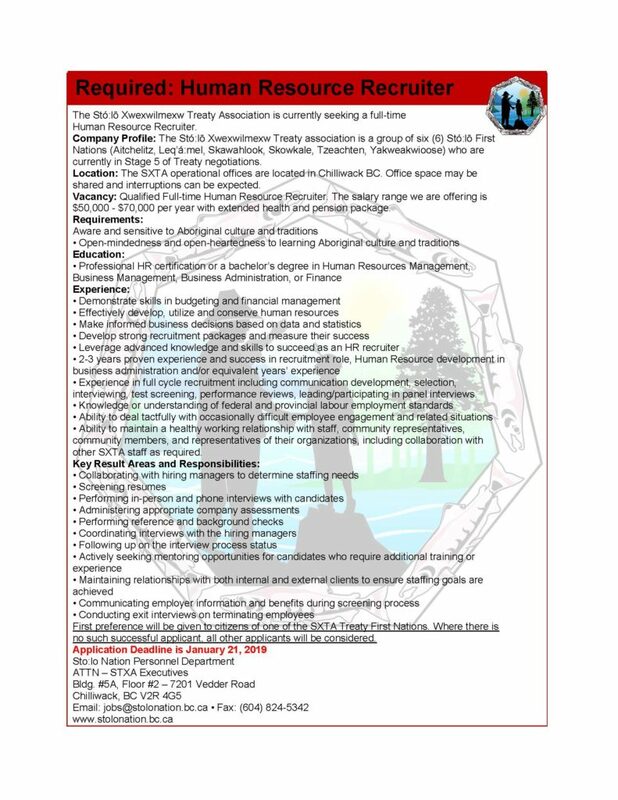 We want our youth (ages 15-25) to engage in and provide input into Community Wellness, Governance, Land Use Planning, Fishing and Careers and more. The SXTA Youth Gathering 2019 will be held on April 12, 13 and 14 at the Sto:lo Coqualeezta Grounds. Youth will stay overnight in a supervised environment and meals will be provided. Win a laptop or an iPad. Play Slahal and camp out! Run for National Leader and Vote! Transportation available upon request. 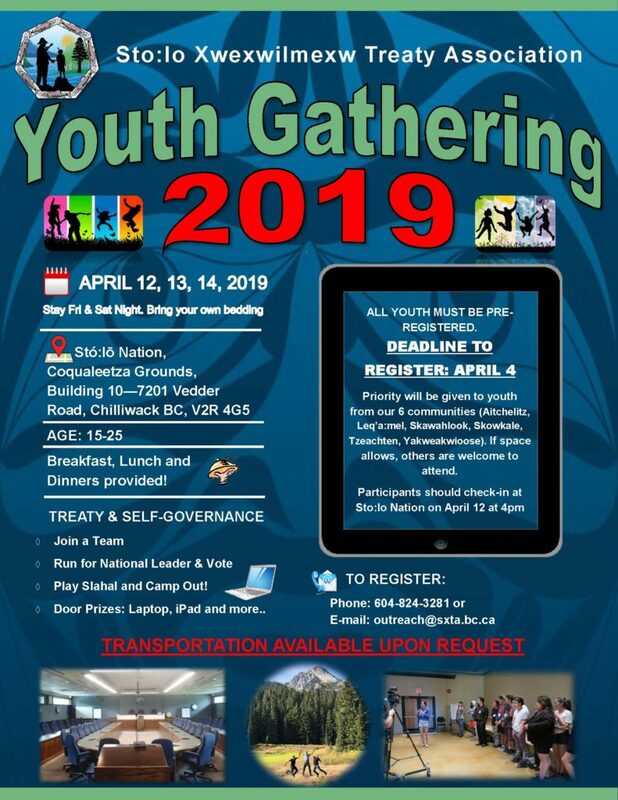 All youth must be pre-registered by April 4. 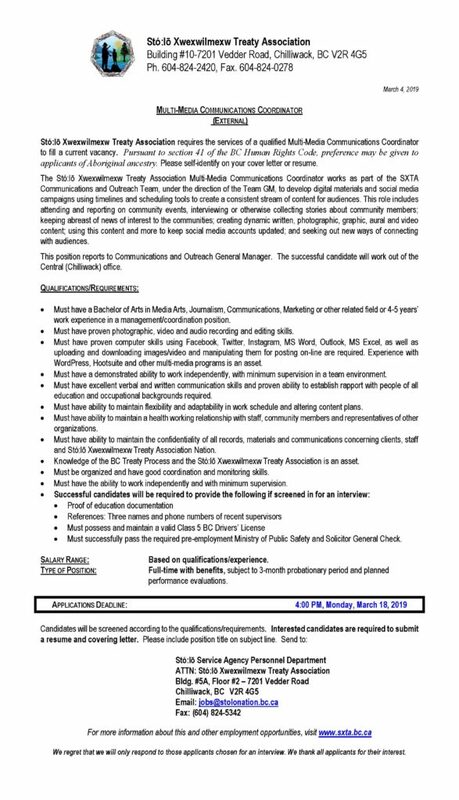 Contact Danya Douglas at 604 824 3281 or outreach@sxta.bc.ca for more information. Find out what life is like after treaty. If you’ve missed the news or want to see what we’ve been up to, check out our Multi-media pages. We have newsletters, videos, booklets and more! 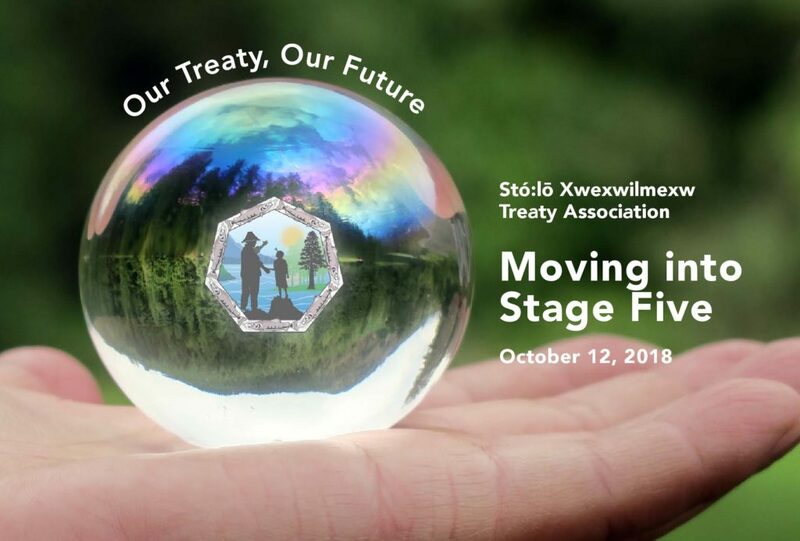 Don’t miss the video of our Moving into Stage 5 ceremony, from Oct. 12, 2018. 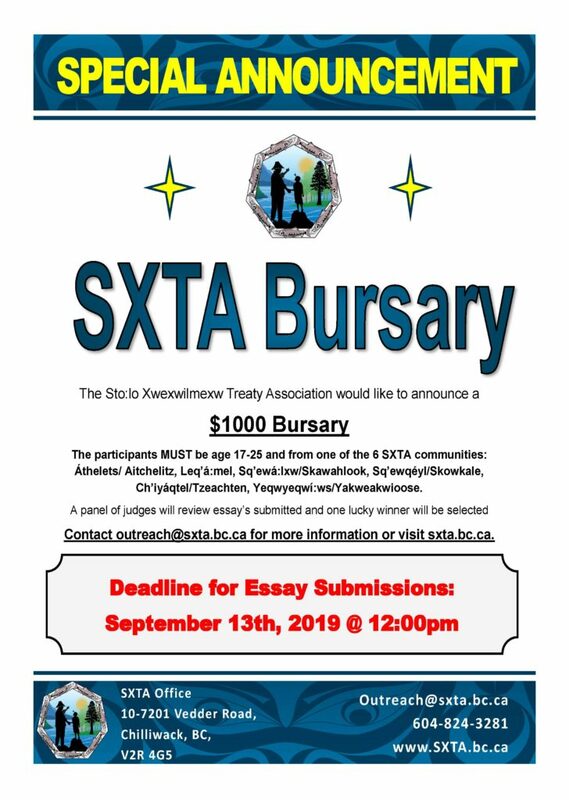 Stó:lō Xwexwilmexw Treaty Association, Government of Canada and Province of British Columbia signed an agreement yesterday that supports new and innovative approaches to modern treaty negotiations in B.C., and advances them to the final phase of treaty negotiations. 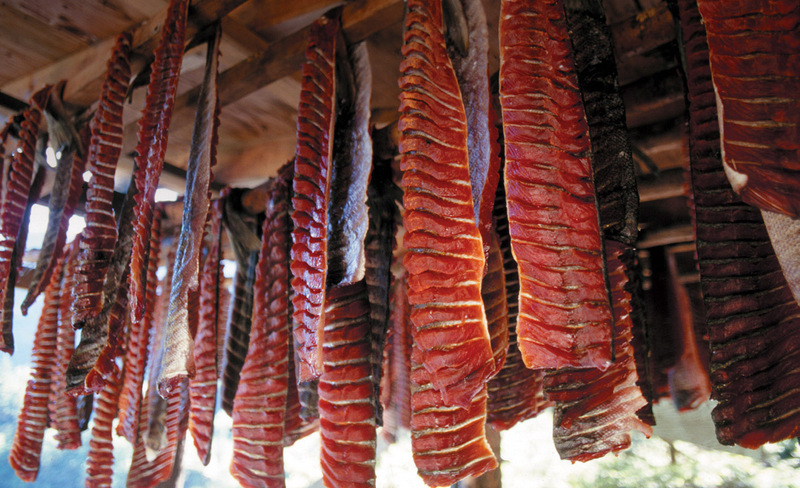 A treaty negotiations Memorandum of Understanding was signed at a ceremony in the Leq’á:mel community by the Chiefs from the six First Nations of the Stó:lō Xwexwilmexw Treaty Association (SXTA) and ministers from the provincial and federal governments. 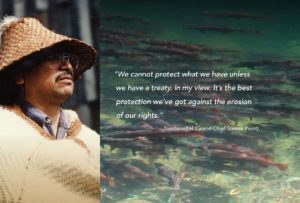 The new agreement commits to a rights-recognition approach for a treaty agreement, consistent with the United Nations Declaration on the Rights of Indigenous Peoples. The new approach explicitly recognizes that Aboriginal rights are inherent and cannot be extinguished or surrendered. It also shifts away from seeking a full and final settlement. 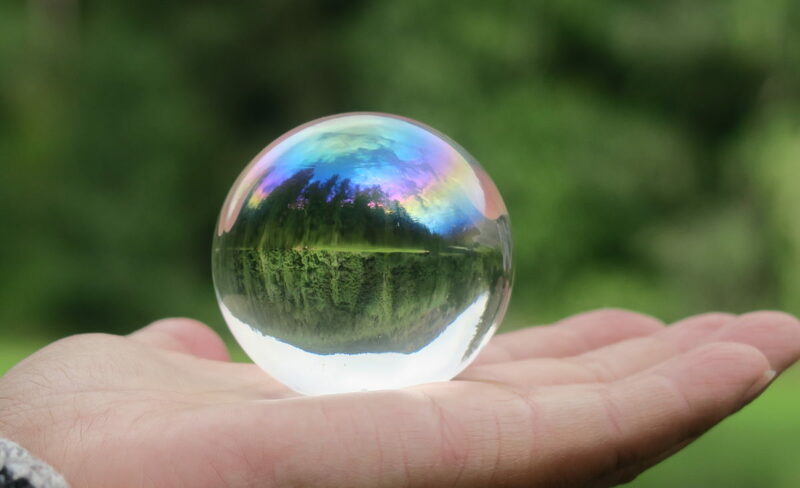 Instead, this new approach builds a collaborative and predictable ongoing government-to-government relationship that can adapt to changing circumstances over time, as policies evolve or new rights are established by the courts, for example. 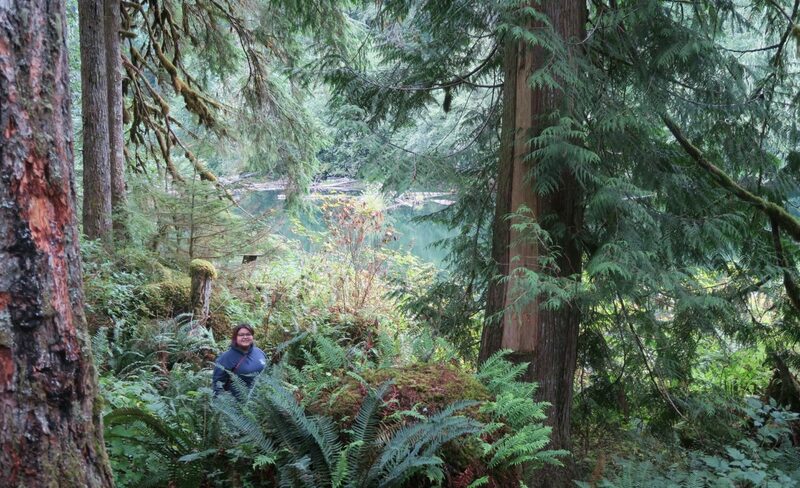 Under this approach, Canada, B.C. and the SXTA have agreed to develop a “core” treaty together. 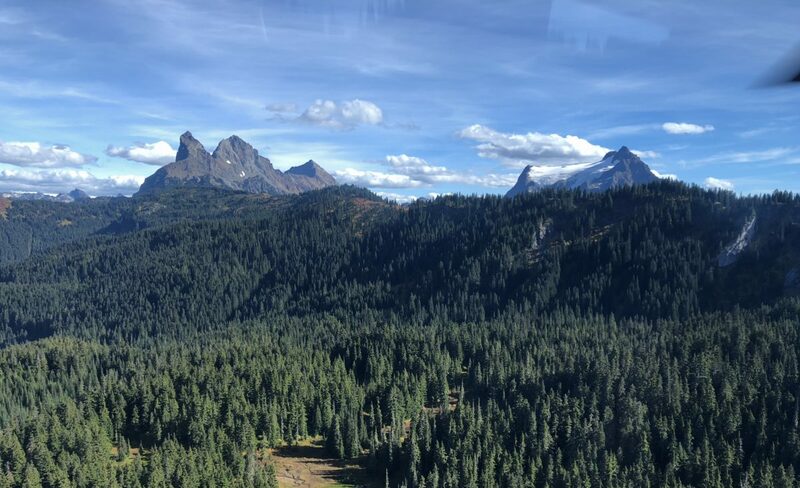 Key elements, such as the constitutional relationship, self-government, land ownership, and jurisdiction, would be set out in a constitutionally protected core treaty. But administrative and operational policy matters, such as program delivery and government administration, would be included in supplementary agreements, which are more easily amended than current treaties. Some topics may be concluded at a later date, as part of a living document. Working collaboratively and developing new approaches to reach agreements is a key part of achieving reconciliation with Indigenous people in Canada. The MOU puts into practice innovations that flow from federal and provincial government commitments to relationships with Indigenous peoples based on respect and recognition, and guided by the United Nations Declaration on the Rights of Indigenous People, the Truth and Reconciliation Commission’s calls-to-action, and case law.